The new Guidelines for U.S.-Japan Defense Cooperation (“the Guidelines”) approved last week provide a framework for the roles and missions of each nation and outline cooperation and coordination mechanisms designed to improve the effectiveness of the alliance. The challenge facing alliance managers now is “operationalizing” the concepts outlined in the Guidelines. In the ten years since the Futenma Replacement Facility (FRF) debate began, not only has the alliance revised the roles and missions for each nation, but Japan has also undertaken steps to legislate collective self-defense, and begun to create its own amphibious force of 3,000 troops, modeled after the U.S. Marine Corps (USMC). Alliance managers should therefore leverage such evolutionary changes in Japanese defense policy to consider alternative solutions for the current FRF plan. Such alternatives should help to operationalize many aspects of the new Guidelines while providing opportunity for greater interoperability of US and Japanese forces. First, empty rhetoric regarding “more joint exercises” should be eliminated. The expansion of joint and bilateral military exercises was reiterated in the new Guidelines, and such language remains a favored suggestion to “improve” defense cooperation. However, Pacific Command (and its service components and sub-unified commands) already participates in hundreds of exercises per year with foreign military forces. Instead of arbitrarily increasing the number of these costly, politically sensitive exercises, efforts should be made to normalize, even routinize, bilateral engagements to the point where it doesn’t require a four-star endorsement or coordination with the Department of State to conduct a bilateral operation – especially if those operations involve routine training missions with allied partners. In other words, we shouldn’t be “exercising” at all. We should be performing routine, daily operations with our Japanese counterparts. Virtually every mission that American forces would be called upon to perform in a crisis situation in Japan will involve interoperability and support from Japanese Self Defense Forces (JSDF). To effectively train for these missions, we need to find ways to create sustainable, constant contact with JSDF counterparts and involve them in daily training missions. To achieve such contact, certain military units stationed in Japan should have, as part of their standing mission, the directive to provide capability building to the JSDF. Japan’s new amphibious force offers an ideal opportunity to do so. Second, the United States should conduct Security Force Assistance operations with Japan’s amphibious force. The new Guidelines highlight Japan’s new amphibious force by outlining their responsibility to prevent and repel ground attacks through seaborne invasions, amphibious operations and rapid deployment. The Guidelines also call for increased partner capability building in maritime security operations. To operationalize both of these aspects of the Guidelines, the USMC should begin Security Force Assistance operations to train, advise, and assist the promising amphibious force that is being modeled after them. 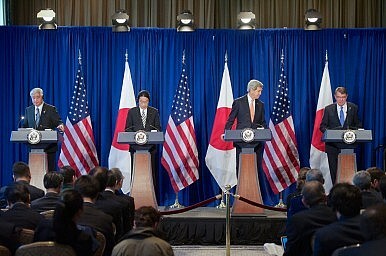 Initiating a standing mission of Security Force Assistance would provide the impetus for the constant, daily interactions that alliance managers would value, the Japanese force would readily benefit from, and would routinize bilateral operations, instead of waiting for another exercise to occur. Third, to further enhance the ability for these daily, bilateral operations, joint-basing/shared use of Futenma Air Station should also be considered. Such shared use of Japanese defense facilities is highlighted several times in the new Guidelines, and has been a mainstay of alliance transformation discussions for many years. The shared use of facilities was suggested in the 2005 Security Consultative Committee Statement, and Futenma’s shared use was often discussed back in 2011, but has since fallen in disfavor for reasons unknown. Formally referred to as Cooperative Security Locations, these shared-use “lily-pads” might consist of only a small number of staff, as well as an agreement with the host nation that the base could be used by the United States as a forward operating base in a time of crisis. Such a relationship could be readily mirrored off the current affiliation between the USMC and the Australian Army, which share joint basing at Robertson Barracks, near Darwin, Australia. If returned to Japan prior to instituting shared-use, Futenma would serve as a Japanese host to U.S. troops, allowing for further “rebalancing” of the U.S.-Japan alliance. Shared-use facilities could entail cost sharing between the two nations, and allow Japan to redistribute much needed development aid to the people of Okinawa. At a time when American bases in Okinawa provide less than 5 percent of the island’s GDP, such aid would provide development support for one of Japan’s poorest prefectures, and would reverse budget reductions from earlier this year. For an island that houses 75 percent of the American forces in Japan on less than 1 percent of Japan’s land mass, this aid would go far to foster support for the central government among disaffected Okinawans. While shared use of Futenma would not alleviate legitimate safety and noise complaints from the surrounding area, returning Futenma to Japanese control would allow Japan to resolve these disputes with the local populace on their own, which may still entail relocation of the base, but under Japanese terms. While there are certainly operational complications that come with shared-use arrangements, the political and strategic payback of removing the United States from the relocation decision would pay dividends, while operationalizing yet another of the Guidelines’ strategic concepts. This roadmap therefore offers three ways to operationalize several strategic concepts outlined in the new Defense Guidelines, while allowing for the adjustment of a decades-old plan in light of recent changes in the U.S.-Japan alliance. In the wake of the standoff between Okinawa Governor Takeshi Onaga and central government officials in Tokyo over construction at the Futenma Replacement Facility (FRF) at Henoko, such adjustments may prove necessary. With varying degrees and options, we can keep Marines in Okinawa and remain true to our promise of returning Futenma to Japan. Investing in the Japanese amphibious force assures our allies of our commitment to their defense, deters potential adversaries from taking aggressive measures, and ensures Japan’s capability to take the lead in preventing and repelling ground attacks through amphibious operations. Such assurance and deterrence remains the cornerstone of shaping operations in the region, preventing unnecessary conflict in an increasingly complex theater. Despite the resumption of construction on the FRF, however, the situation remains far from settled. While current efforts at resolving the issue may still support the relocation of Futenma to Henoko, continued delays and challenges may necessitate the consideration of alternative solutions – solutions that operationalize the new defense Guidelines and have been updated to reflect changes in the U.S.-Japan alliance over the last twenty years. Will Atkins is a Sasakawa Peace Foundation Non-Resident Fellow with Pacific Forum CSIS, and an Adjunct Fellow with the American Security Project. The opinions expressed in this article are his own, and do not reflect the position of the Department of Defense or United States Government.